Photos by various photographers; used with permission of teen bodybuilder Nick Wright. If you subscribe to modelJOCK.com, then you've already seen part one of the exclusive interview I did with rising teen bodybuilding phenom Nick Wright. This muscular dynamo gave such a great interview that I had to divide it into two parts, so here is the rest, along with some additional photos and links to videos from his Youtube channel. 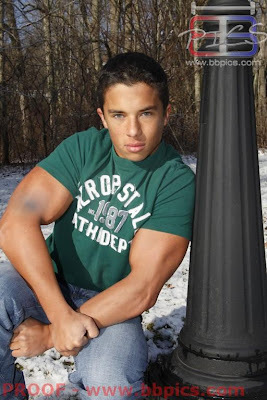 Teen bodybuilder Nick Wright shows off his massive biceps. How did you get started doing videos? I'm actually glad this came up, because it gives me the chance to reiterate the point that I am not now, nor have I ever been, focused on being an online trainer, how-to guide, or fitness guru! I literally, just always did my own thing, and people watched. I had made a channel, using the name of a fictional character I had come up with in 6th grade. I had never planned on using it, aside from simply viewing videos. Here and there I would occasionally try to post homemade posing videos way back at 14, before I had a real physique or reputation. Muscular teen bodybuilder Nick Wright working out in the gym. Are those early videos still around? I took those down, but ended up posting my competition footage years later. I would upload my routines or prejudging and forget all about them until I went to post another, a year later. One day I decided to check my stats and realized with only nine videos I wasn't paying attention to, I had already built up over 400 subscribers, and over 100,000 views. I had heard all about YouTube partnership and realized I could do something with this, and began to apply the effort. As time went on I realized that I could have an actual impact on this sport. There are enough shirtless gurus out there, so I didn't want to be another fitness instructor, even though I DO have a couple "how to" videos up. I stuck to my guns (no pun intended) and continued keeping the theme of just doing me — just the life and career of another teen bodybuilder. Muscular teen bodybuilder Nick Wright strikes a pose in men's underwear. So the video channel has been a big success. Let me tell you: This channel BLEW UP! I only have around 7,000 subscribers at the moment, yet shooting toward two MILLION video views. The attention doesn't match the numbers! I believe many of the kids watching are around my age, and don't want to admit to themselves that they want to subscribe to another teen. I probably wouldn’t, it’s fine! But they are definitely watching, because I am now getting recognized in public! Events, Vitamin Shoppe demos with RTN, even public gyms! It has generated attention from photographers and magazines. It also led to the amazing opportunity to take part in this interview. It's pushing the sport of bodybuilding out into the mainstream! Muscular teen bodybuilder Nick Wright flexes his biceps and shows off his back. You have great presence in your videos. How did you develop your speaking skills? Thank you! I LOVE public speaking! I get a rush from it. I have worked a couple of different sales jobs in the past, and jumped to top positions, as well as taken a public speaking class in high school. Apart from that, I just pick it up as I go; I can also freestyle rap, which many don't know, so I love make shifting on-the-spot speeches. Teen bodybuilder Nick's girlfriend applies his tan before a competition. You work full-time in maintenance installation and have a girlfriend of 2.5 years. How do your girlfriend, co-workers, friends and family feel about your amazing progress and awards as a bodybuilder? At this point, I am down to part-time [work] and loving it. My boss is very supportive of my on-going career, and actually sponsored me for my last competition. My girlfriend, Carly, is the backbone of my success. She is just like me when it comes to the drive and high aspirations in life. She helped nail my competition tan, being a cosmetologist, made a last-minute business card for me when I met RTN at a show, helps with modeling resumes, picks my best photos, hits the gym with me (sometimes) and, most importantly, is ALWAYS there for me when I really need someone at those notorious "low" points we all reach. Teen bodybuilder Nick Wright goes shirtless with a workout partner at the gym. And your family has been supportive too? My family and friends are always there for me, and are extremely supportive and enthusiastic about everything I have been doing. My Dad is my number one supporter in my life. He was taking me to the gym after school every day despite working night shift. I would not be where I am at without him at this point. Shirtless and pumping: Teen bodybuilder Nick Wright in the gym. You describe yourself as a "teen bodybuilder" in your videos and profiles. When do you turn 20, and how will you describe yourself when you're no longer a "teen bodybuilder"? Ha ha, you have no idea how much I think about that. My entire persona and reputation has been built around [the identity] "Teen Bodybuilder Nick Wright." I actually feel it is the "wow" factor in everything I do, being so young. After deciding lying wouldn't work and people would eventually catch on to me being 19 for multiple years straight, I figure I will just do what I do with everything else in life: Put it off until it comes time to improvise [at the] last minute. I turn 20 in June, so I have a full year as a teen competitor left, and I plan on making the most of it. After that, you will probably see "Junior Bodybuilder - Nick Wright" popping up. Muscle flex: Teen bodybuilder Nick Wright flexing at the gym. What are your long-term goals in terms of your body and fitness regimen? I plan on growing as huge as I can possibly get while remaining natural. Bodybuilding is all about taking it to the extreme and pushing as far as you can go! Muscles and all: Nick Wright is one of the most-followed teen bodybuilders on the Internet. Would you like to continue developing bodybuilding and modeling as a career? Yes, absolutely! I sincerely plan on making that my ONE career. I love speaking and really want to make public speaking/spokes modeling a major part of my life in the bodybuilding/fitness community. I am already doing that with my sponsors, RTN, and want to expand. I love traveling on business, and hope/intend to do so a lot more for modeling as well. I began doing fitness modeling, and moved onto fashion as well, and recently got involved in commercial which I would love to journey deeper into. I plan on incorporating all of this into bodybuilding, and bringing the lifestyle out into the open. 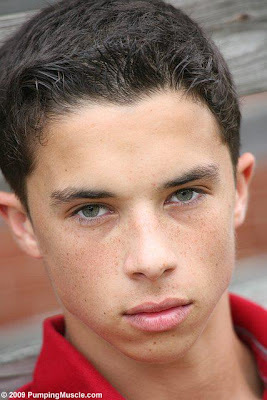 The eyes have it: Teen bodybuilder Nick Wright shows his talent as a male model. Ironically enough, there is actually a lot I don't like about modeling, despite the natural knack I seem to have for it. Of course, with the right photographer, it can be an awesome experience. What I like best about modeling would be the chance give to communicate with the camera through emotion, to be able to connect with inner emotion, circumstance, and learn to control your body right down to facial features, enough to portray any given feeling or look. When working with good photographers and legitimate companies, modeling also brings out the beauty that is sometimes overlooked throughout the day. Pumped up: Teen bodybuilder Nick Wright, shirtless and working out in the gym. If you could give one piece of advice to people looking to stay in shape, what would it be? RESEARCH, RESEARCH, RESEARCH!!! You have to know what you are dealing with. Spend hours watching not just mine, but all sorts of videos on bodybuilding or the given area of fitness you are looking at. Ask questions, and never hesitate. I did not wait until I thought I was ready or until others gave me the okay to compete. I waited until I wanted to!